I was never quite sure what to make of people’s outright indifference towards, or ignorance of, Television’s sophomore album Adventure. Here you have a legendary band’s follow-up to an unquestionable masterpiece debut (Marquee Moon), and the most common reaction I would receive when discussing it was either an admission of having never heard it or of finding it underwhelming when compared to its predecessor. Put me squarely in the camp of those who have always loved Adventure. It was the perfect album to follow a perfect album. It both retains touches of the debut’s cache of detached cool and ennui, making it seem familiar, yet also steadily chips away at that exact veneer. 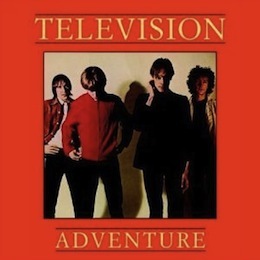 A more moving record than Marquee Moon; Adventure’s lyrics seem more lived-in and worn—more honest and warm. When Tom Verlaine sings in “Carried Away” that “last night I drifted down to the docks…I felt the old ropes grow slack,” he seems fragile and temporarily corporeal, likely to depart this plane at any moment. This is not the street-smart smirk of “Venus.” This is a vision of meaning, of experience. It’s no wonder that a friend of mine heavily considered performing the song at his mother’s funeral. Adventure opens with one of the most genuinely catchy songs of Television’s career, the proto-R.E.M. jangle of “Glory.” The album has its share of poppier moments like that: the wistful, chiding Greek chorus vocals of “Careful;” the strutting, angular sing-along of “Ain’t That Nothin‘.” These songs are positioned at key intervals throughout the album, giving the record an ebb and flow of energy that wasn’t as readily obvious on the heady Marquee Moon. The studied nihilism of the 70s punk scene, so integral a lyrical presence through most of its greatest works, is here washed away in a baptismal of reflection. From “Days” and its gentle admonition of the oncoming of time to “The Dream’s Dream” and its rendering of the very nature of existence and reality to the aforementioned “Carried Away” and its rejection of the moorings of body and place; that a singular album of modern music, clocking in at a swift 37 minutes, could channel so much in so little is nothing short of astounding. adventure is magificent. i covered Days on my solo album 1997 but it’s rank in comparison. i just thought it would be fun to do it! the first 2 television albums, like the first 2 talking heads albums are some of the most important records i own. Luminous always comes to mind w/this record…it seemed logical to me & the most ‘punk’ thing they could have done at that point was to make an achingly beautiful record, but the orthodoxy didn’t concur. And obviously this was never going to garner major radio spins. You may be interested in this. I always heard Adventure as the lesser album. Not bad, still really good, no doubt, but not on the same epic scale. After reading this I’m going back to rediscover it. I dunno. It still feels small in comparison. Not that it’s not great. But the comparison is like Sargent Pepper vs Rubber Soul. Rubber Soul was a great album, but Sargent Pepper was the milestone. Great point. I was one of those who adored Marquee Moon and then completely ignored Adventure. My son had to bring it to my attention last year. Now I am a fan. You might to post some of Televison’s concert tracks. I don’t remember liking Marquee Moon at all, but I’ll give this a chance. I’ve always liked Adventure *better* than Marquee Moon. Maybe it doesn’t rock as hard, but the lyrics and melodies are noticeably better. And “The Fire” just rules. The problem is “Foxhole” which sticks a spoke in the first side from which it never recovers. Second side is solid, but it’s an album that needs to build, and stupid “Foxhole” never lets that happen. Thanks Mo (#4), your blogs are amazing! Yes! I’ve always been a fan of this record too. It’s a bout time there is a critical re-examination it. “Adventure” lives up to Marquee Moon in so many ways, it’s hardly anyone seems to dig it. So much so that I found an original pressing of it on Red vinyl for like 10 bucks. WTF. hahaha good for me. Adventure is full of great songs but I think that one problem is that the songs that need a bit more bite (like Foxhole and Glory) are weakened by the toned-back production and performance, check out the versions on the live recording of them touring Adventure in ‘The Old Waldorf’ that came out a couple of years back for comparison.